If you are struggling with achieving and maintaining clear skin, chances are you have tried a plethora of cleansers in an attempt to resolve whatever the issue is. As you’ve searched for blemish or anti-aging remedies, you’ve likely come across methods that claim to be effective but fail to provide clear skin results. At Kallgren Dermatology, we are skin care professionals who know how to properly treat a variety of skin conditions and have the equipment to do so in our Boulder dermatology clinic. We understand the immediate frustration and embarrassment that acne and other skin problems cause you, especially when they seem to appear out of nowhere. Most people make the mistake of treating their skin on their own based on something they read from a not-so-accurate source. Unfortunately, most of the time their efforts end up unsuccessful without any results or make the issue worse and become a waste of time. If you’re reading this article, then chances are you are researching how to clear acne fast or are looking for other skin care remedies — if so, continue reading because we’re going to reveal the truth about skin care and common skin care myths. Contact our office today to schedule a consultation with one of our Boulder dermatologists! Skin Care Myths: What Is Fact or Fiction? Not everyone is a skin care expert, and that’s okay. However, when people aren’t certain about something like how to achieve clear skin, they resort to the internet for answers — and we all know how difficult it is to escape the endless do’s and don’ts that many articles suggest. The truth is, the internet is full of contradicting information that ultimately leaves people in the dark as they try to understand what’s true and what’s not. That’s why we encourage you to seek the help of an expert and consult with a dermatologist for an accurate treatment plan. 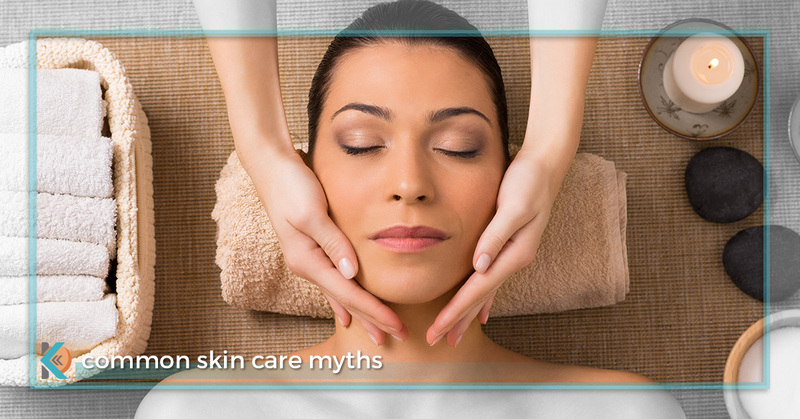 In the meantime, here are the most common myths about skin care you should avoid. Myth: Sunscreen isn’t necessary on a cloudy day. Sunscreen is always recommended — especially in Boulder, or anywhere in Colorado for that matter. There is no such thing as a “sunless” day. Even when the sun is hiding behind a thick layer of clouds all day long, your skin is still being exposed to UV rays. Even if you don’t see the effects of sun exposure (sunburn), the UV rays of the sun cause photoaging, which is the technical term for premature skin aging, and it doesn’t take much exposure for that process to begin. An hour of unprotected skin exposure to the sun can add up over the years, resulting in wrinkles, age spots, sagging, and more. Protect your skin by wearing protective layers and applying a broad-spectrum sunscreen daily. Many face moisturizers incorporate SPF 15 to make it easy to put on every day. Myth: High SPF = better skin protection. While this concept makes complete sense, unfortunately, it is not true. Sunscreen with SPF 15 protects your skin from 93 percent of UV rays and SPF 30 protects your skin against up to 96 percent of UV rays. Anything beyond SPF 30 provides a very minimal increase in protection of only 0.1 percent. The only increase you’ll see with higher SPF is an increase in price, so save money and apply SPF 30. Many skin products will claim to gently exfoliate the skin. The truth is, “gentle exfoliation” isn’t real. In order for exfoliation to be effective, it requires force or a strong acidic chemical to remove damaged skin cells and encourage collagen growth. Skin products that include granules in the solution won’t provide the necessary force to remove the dead skin cells, but it will leave a temporary polished feel to the surface of the skin. A dermatologist would likely recommend a chemical peel that uses a glycolic acid exfoliator to achieve a proper exfoliation of dead skin cells. Myth: “Dermatologist recommended” products are proven to work. This is simply a marketing trick that manufacturers use to persuade consumers to buy their products. The terms, “dermatologist recommended” and “dermatologist tested” are often used to insinuate that a panel of professional dermatologists unanimously agreed that the product is effective. In reality, those phrases are simply used because at least one dermatologist tried the product and saw no negative effects. Consider yourself warned when you see products using those phrases, and know that it does not mean that the product is guaranteed to work or that there is valid proof of the product’s performance. Myth: Use hot water to open pores. Washing your face with hot water does very little for the health of your skin, and certainly does not open pores. Hot water can actually have the opposite effect of doing favors for your skin and could wash away essential skin oils, leaving it dehydrated and irritated. Steam is the best way to open pores without damaging your skin. Myth: The more you wash your face, the better. The concept makes sense, however, this myth is false. Over-washing your face can lead to dryness, sensitivity, and irritation. Washing your face before bed and first thing in the morning is a good routine to follow. Myth: Toothpaste will make pimples disappear. If only getting rid of a pesky pimple was this easy, but sadly this myth is false. Toothpaste contains ingredients that can dry out the skin, and some toothpastes have certain ingredients that will cause the skin to burn. Topical spot-treatments that include benzoyl peroxide or salicylic acid are better options, and neither of those ingredients are found in toothpastes. Myth: Junk food is the primary source of acne. It is a fact with evidence proving that foods with refined sugars and foods that are high on the glycemic index drive acne; however, it is not the primary cause of acne. Diet does play a significant role in the appearance of your skin, but it is only one part of a much larger issue. There are a lot of myths and false remedies to treat skin conditions like acne. Not only are the myths false, but they waste your time, disappoint you, and can even damage your skin — which defeats the entire purpose when you’re trying help improve the condition of your skin. Our Boulder dermatology clinic is the best option for you to get the clear skin you’re seeking. The dermatologists at Kallgren Dermatology will see you initially for a consultation to evaluate your skin and the severity of your skin’s condition. Once we have a chance to see you in person, we’ll suggest the best acne treatment or service for any skin condition you’re suffering from. Contact Kallgren Dermatology today and schedule your free consultation!